Yes I know I can be done like that.... its that tall tower of control pots ...its just not a logical layout for an 8 channel mixer. As i said its more of a visual tidiness/ simplicity thing. Looks interesting . will dive into playing with this next chance I get. Since there are currently no layout options for object/subpatch controls, you're stuck with vertical layout. i like the per channel thing, it looks nice and tidy. i also really like the way it allows you to have as many or as few channels as you want. I'm just thinking I'll go a bit further with that... would be nice to be able to set how many channels are actually being used.. so they don't need processing power if not used.. 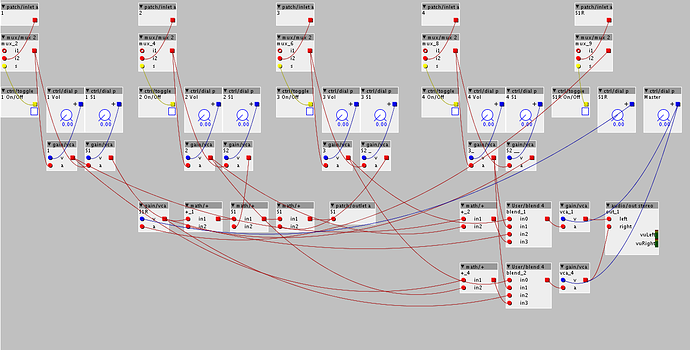 Otherwise, my other dream would be to have an adaptation of the BBcut live algorithmic breakbeats module. 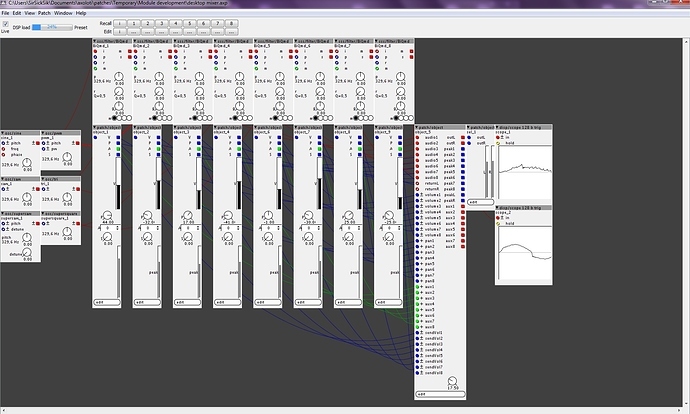 Mdsp @ Smartelectronix did a great vst adaptation for it some years ago : livecut . I think it leads to better "partitioning" if you want to combine multiple inputs to a certain output range, you can use a mixer, connect a "ctrl/dial p" to the bus inlet of a mix for bias if needed. Or a math/*c for a single input when an offset parameter would be redundant. Would that address your needs? @johannes Yes I think it would be sufficient and I understand your solution very well. Thanks for looking into it. scales the incoming signal to the min/max values set on the module. Clips if incoming signal goes beyond limits set by the inMin and inMax parameters and scales it to the range set by the outMin and outMax parameters. Id like to request a complex "macro oscillator" like Braids. Or digital sound source as they also call it. Someting that can really change the sound drastically and give a lot of different timbres with just a few knobs. Cool, will look into the rub-oscs. I am pretty much covered on the wavetable side already, but yeah, gonna test it anyway. I would like to request a mixer. I made one as subpatch, but I am confident that it is way more DSP friendly to build a custom object for it. Pictures and patch below. This one got a build in send effect, that is what the output is for. Dunno if possible to make that. it also features panning for each channel and main volume output controls for the stereo and send outputs on the mixer-core. A sampler module. I have a bunch of loopable jupiter 4 samples and i would like to make a virtual sample based model. -Load X amount of samples into the module. -Set keyspan for each sample. - A "nice to have" would be to be able to adjust loop mode= Reverse/back& forth etc.